NCCPR Child Welfare Blog: Oregon’s child welfare director wants to institutionalize five-year-olds! 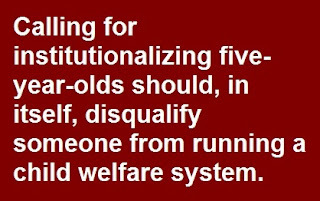 Oregon’s child welfare director wants to institutionalize five-year-olds! Some of the “littles,” as Marilyn Jones so cloyingly calls them, could wind up in “repurposed” juvenile jails. I described how an expose of abuse in foster care by the alternative weekly Willamette Week whacked the state into raising standards for foster homes. So the state wound up warehousing foster children in offices and jails. So -- whack! -- a child advocacy group brought a lawsuit to prohibit the practice. The Oregon Department of Human Services (DHS) settled. And children promptly wound up warehoused in hotels. So –whack! – there was another lawsuit, and another settlement. Now, more than two years later, behold! The Oregonian reports that the foster children are back in juvenile jails. But this time there’s a twist. They’ve repainted the cinderblock, added some pretty pictures and slapped new labels onto the jails – so now, the Oregonian tells us, they’re “repurposed juvenile jails” [emphasis added]. Critics question whether former jails are the right place for foster children. for many, such placements mean moving far from their home communities, switching to unfamiliar and sometimes segregated foster-child-only schools and losing the chance to live in the care of a parent figure instead of a rotation of shift workers. … Nationally the movement in child welfare is away from caring for children in institutional settings, which research has shown yields poorer outcomes. But once again, as with every other story I’ve seen in the Oregonian over the past several years, this story makes no mention of the root cause of this pathetic game of whack-a-mole: Oregon’s obscene rate of child removal and the failure of state government, the state legislature, and almost all of the state’s media to confront it. But one thing has changed. It used to be that state child welfare officials would say that of course it’s terrible to institutionalize kids, but they would claim they have no choice because of a “shortage” of foster parents. That’s not true – Oregon does not have too few foster parents, Oregon has too many foster children. But leave it to Oregon Child Welfare Director Marilyn Jones - the poster-adult for child welfare mediocrity to suggest something even worse. Jones is now saying that no matter how many foster parents Oregon recruits they will never be capable of caring for all the children who are now institutionalized, and even more need to be institutionalized in the future. So either Jones has an astonishingly low opinion of Oregon foster parents or Jones is clueless about best practice in child welfare. When Jones says Oregon should institutionalize more children, she’s not just talking about teenagers – though that’s bad enough. Jones told the legislature she wants more beds to institutionalize children as young as five – children she cloyingly refers to as “the littles.” Calling for institutionalizing five-year-olds should, in itself, disqualify someone from running a child welfare system. But Jones and her colleagues in DHS management are not the only ones to blame for this mess. ● Almost as culpable is State Sen. Sara Gelser. Oregon media seem to believe no child welfare story is complete without the obligatory quote from Gelser. But Gelser has made the crisis worse by promoting hype and hysteria over high-profile tragedies and undermining what little DHS has tried to do to curb needless foster care. It’s time, Gelser said, for the state to figure out how to find the appropriate place for the state’s most vulnerable children. Actually, it’s time for Gelser to figure out that the appropriate place for a large number of those children is their own homes. 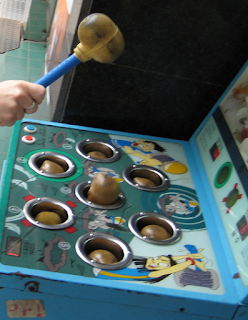 ● The organizations that brought the whack-a-mole lawsuits – the one that said you can’t use jails and offices, but didn’t mention hotels, and then the one that said you can’t use hotels but was silent about “repurposed” jails -- also share responsibility. Since the lawsuits never addressed the high rate of removal, DHS was never forced into the one solution that would really work: Taking away fewer children, thereby opening places in good foster homes for all the children who really need them. The no-hotels settlement was supposed to get more children and teens who’ve been removed from their families into the family-like settings that experts and Oregon’s foster children’s bill of rights say gives them the best chance to flourish. But having already seen that the lawsuit against keeping kids in jails led to keeping kids in hotels, how could they have possibly believed that stopping DHS from warehousing children in hotels wouldn’t wind up sending them right back to jails – albeit “repurposed” ones? ● Most of the state’s media also share responsibility – especially the Oregonian, which for years has chosen to ignore the state’s outrageous rate of child removal. If most Oregonians don’t know about the real rate of abuse in foster care, and if most Oregonians don’t know about the mass of research showing that, in typical cases children do better in their own homes even than comparably-maltreated children placed in foster care, it’s because the Oregonian and most other Oregon media don’t mention those details. If “repurposed” doors on “repurposed” jail cells start slamming behind five-year-olds anytime soon, primary responsibility rests with Marilyn Jones. But Sen. Gelser, the lawyers who brought the whack-a-mole suits, and the Oregonian all will have helped to put those five-year-olds in those cells. Does child welfare have a “Max 8” problem?